I don't know about all of you, but I was born with 2 left feet. My mom tried to help me become more "graceful" and sent me to ballet lessons when I was 12. Well that was a real experience to say the least. I was tall and awkward, and decided then that learning to dance publicly was not for me. I was recently given the opportunity to try out Dance Lessons Starter Kit and Ballroom Dance Mastery System. Let me say these are more my idea of how to learn to dance. I can learn at my own pace and in the privacy of my own home until I'm confident enough to hit the dance floor in public. 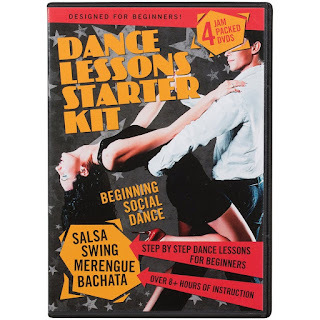 Dance Lessons Starter Kit is a 4 DVD set. It teaches Salsa, Swing, Merengue, and Bachata. I like that I can watch and rewind if i want or need, and just take it step by step. Ballroom Dance Mastery System is a 7 DVD set, 1 for Foxtrot, 2 for Rumba, 2 for Swing, and 2 for Waltz. Both sets break each dance down step by step and progressively put the steps and moves together. That makes learning to dance easy and fun, not to mention the money you save by learning at home instead of a costly studio...and no embarrassment involved. Ideally you should probably have a dance partner to learn with but I've been doing the lessons alone and having a blast doing it. I find myself practicing while I'm doing chores around the house, and if I do say so myself I'm getting better at it.